Zaytinya is extending their Mezze Ora, a happy hour I adore: $4 pomfili and Yuengling draft beer and Almaza bottle, $4 selected red and white wines by the glass and $4 mezze specials. Jaleo is having $4 tapa and drink specials, sangria and draft beer. Oyamel extends Hora Feliz featuring $4 classic margarita, ponche and selected draft beer, 2 for $4 taco specials and half off all wines by the glass. Cafe Atlantico starts their specials on Wednesday (to allow for Carnival) and they are having half-off their entire bar menu, half price mojitos (some of my favorite in town!) and $5 Dos Equis and red/white wine. The offers will last until Sunday. 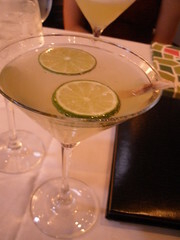 As I was writing this, I realized that Cafe Atlantico’s mojito and Zaytinya’s pomfili have both wound up as top cocktails for the Eat Like Me feature in the past. I think Jose Andres has some of the best drinks in the city, due to the hard work of superstar Jill Zimorski and the head mixologists at each of the restaurants. So cheers to no more snow, and cheap drinking for the rest of the week. What type of food is on the bar menu @ Cafe Atlantico?